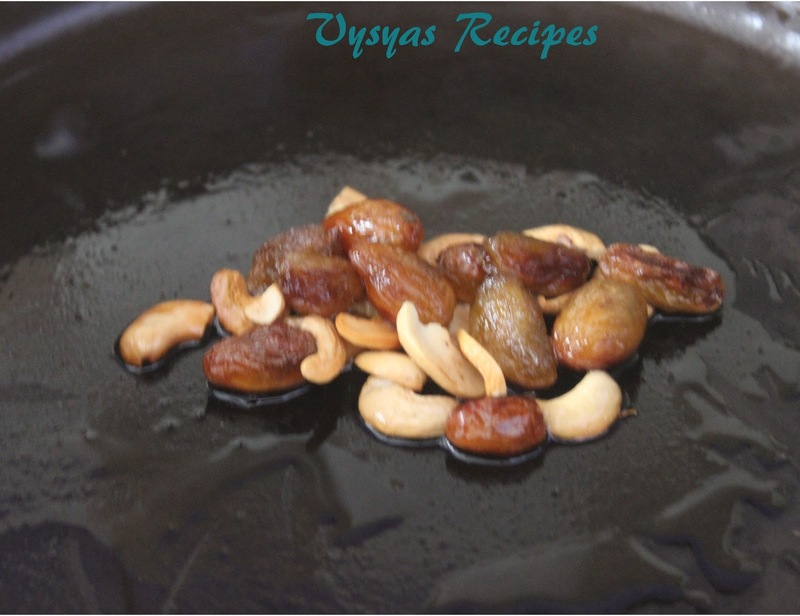 Aval Payasam is made with Roasted Poha in a ghee, & simmered in a thick milk, jaggery is added for sweetness & finally Garnished with Cashews & Raisins. 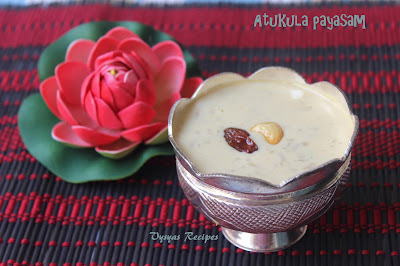 Poha is favourite for krishna, so I am posting this payasam for Krishna Jayanthi. Poha is a filling Ingredient, which provides energy till next meal, so this Payasam is also taken during fasting or Upvas. Prep Time : 5 min. Melt the Jaggery in 1/4 cup of water, and filter it to remove the impurities, & allow it to cool completely. 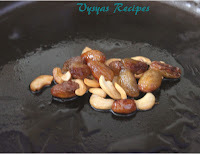 Heat the Ghee in a Pan, fry cashewsnuts when it turns light Golden brown colour, add Raisins, when raisins Pops remove both of it from the Pan. In the same Pan, add Poha & saute it, till you get nice aroma.Add the boiled Milk to heavy bottomed Pan & sim it, until it reduces its volume to 2 cups. Then add Roasted Poha, cook in Medium low flame, till it turns soft, & blends well with Milk. Add Jaggery give a quick Mix.Swich off the flame. Finally Garnish with Roasted Cashews & Raisins. Cool the Jaggery Completely before adding, else there might be the chances of Curdling. After you add jaggery switch off the flame,completely else milk may get curdled. you can add 1/4 tsp of Cardomom Powder, for extra flavour. you can soak 2 -3 Saffron strands, in 2 tbsp of milk for few minutes & add that milk, after adding jaggery syrup, & give a quick Mix. Serve it hot or chill.